For most of human history hunting and gathering was a universal way of life. Richard Borshay Lee spent over three years conducting fieldwork among the !Kung San, an isolated population of 1,000 in northern Botswana. When Lee began his work in 1963, the !Kung San were one of the last of the world’s people to live this life. By 1973, when Lee last lived with the group, it appeared that they !Kung were a society on the threshold of a transformation that signaled the end of foraging as an independent way of life, at least in Africa. 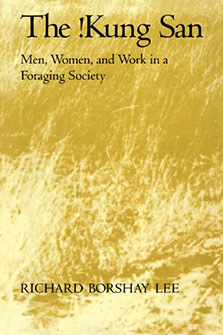 The !Kung San: Men, Women and Work in a Foraging Society, an ecological and historical study, is Professor Lee’s major statement on his research. By maintaining simultaneous historical and synchronic perspectives, Lee is able to extend his analysis of core features from the contemporary !Kung to prehistoric societies. These basic principles become the means to understanding the form of human life that has been obscured by the developments and complications of societies during the last few thousand years. Richard Borshay Lee is a Canadian anthropologist. Lee has studied at the University of Toronto and University of California, Berkeley, where he received a PhD. Presently, he holds a position at the University of Toronto as Professor Emeritus of Anthropology.